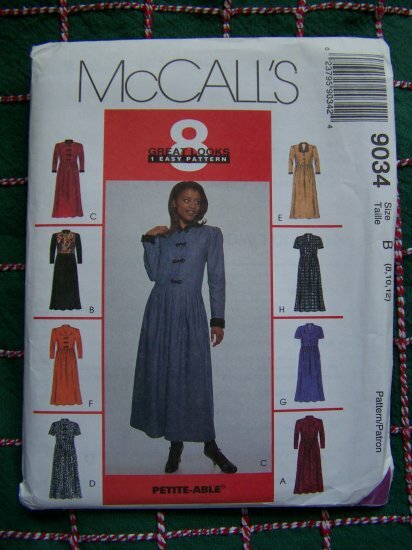 1990's McCall's womens 8 great looks dresses sewing pattern 9034. Misses sizes 8 - 10 - 12. Easy fitting dress with sleeve and collar variations has pleated skirt, front and back darts and back ties. More new, vintage and out of print sewing patterns listed. Last one. Measurements: Bust 31.5 - 34". Waist 24 - 26.5". Hip 33.5 - 36". Suggested fabrics; Rayon and rayon blends, washed silk, lt wt denim, challis, tissue faille, soft crepe. All garments no diagonals. S & H to USA is $2.25 first class. I use priority flat rate envelopes for $5.00 shipping and can fit a lot of patterns inside.